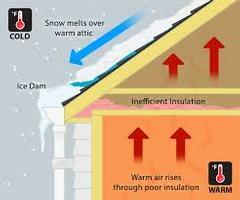 If you have had Ice Damming in the past or if you want to be proactive by taking the steps to prevent it from happening Kulp's of Stratford can help you stay warm and dry this winter. Our sales team will discuss your options and put together a solution that is taylored to your home. Give us a call at 715-687-3368 or visit our show room 2 1/2 miles east of Stratford on Hwy 153.